As a mother of two young girls I have very little time to give to cooking. Still, we all love pancakes, but it takes time to make and fry them. That is why I have made some huge pancakes one of these days. They save you time and trouble of baking them. Take a look at my huge pancake recipe. This plate is the largest plate I have. So, the pancake is huge. Basically, I mix all the ingredients up, except for the curd. When the mix is ready, I crush curd with the fork or grind soft cheese and add it in. Now, we are ready to bake the huge pancakes. I heat up the pan well and pour enough of mix to cover up the entire pan. I also make a pretty thick layer of the dough. Then I put a top over the pan. This helps the huge pancakes to get cooked faster and better. 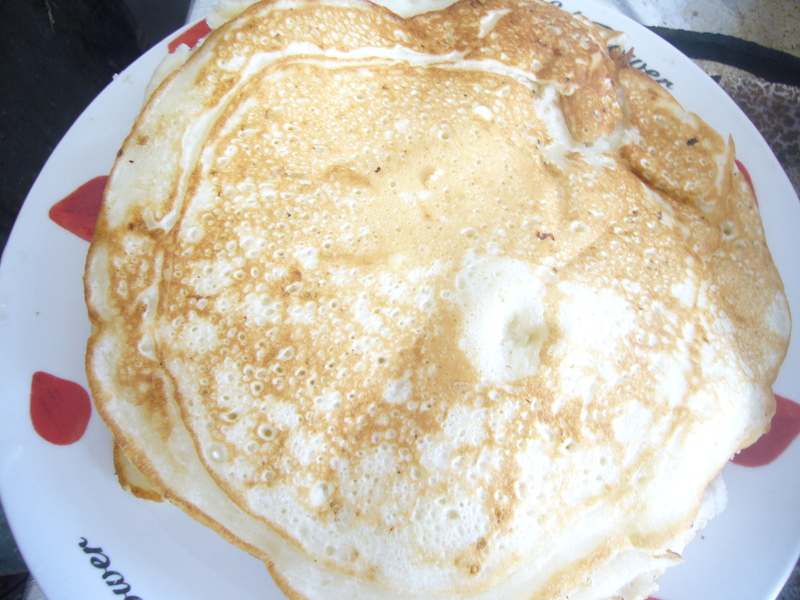 I serve these huge pancakes with honey or sour cream. Of course, you can use the same mix recipe for making regular pancakes. But, baking large size pancakes saves you time. This way, you can make just one huge pancake for every family member! You can also get two pans on the stove and double cut the time, spent on baking them. This entry was posted in Easy Recipes and tagged breakfast recipe, busy mom, cooking, cooking tips, easy cooking, easy recipe, eggs, family cooking, flour, food, huge pancake recipe, huge pancakes, mom help, pancake recipe, pancakes. Bookmark the permalink.